Elite Trader App Review – Scam Or Legit? Welcome to my review of the Elite Trader App, the latest system to launch which claims it’s the highest yielding money making service there is & that over 4,600 people have already been profiting from it’s method. Once again here I am to find out the truth behind this new system & to investigate whether or not it’s claims are actually true. First off I want to let you know that I’m not an affiliate of this software so what you’ll be getting here is a completely honest review. This is actually another binary options systems but you probably already guessed that from it’s name. 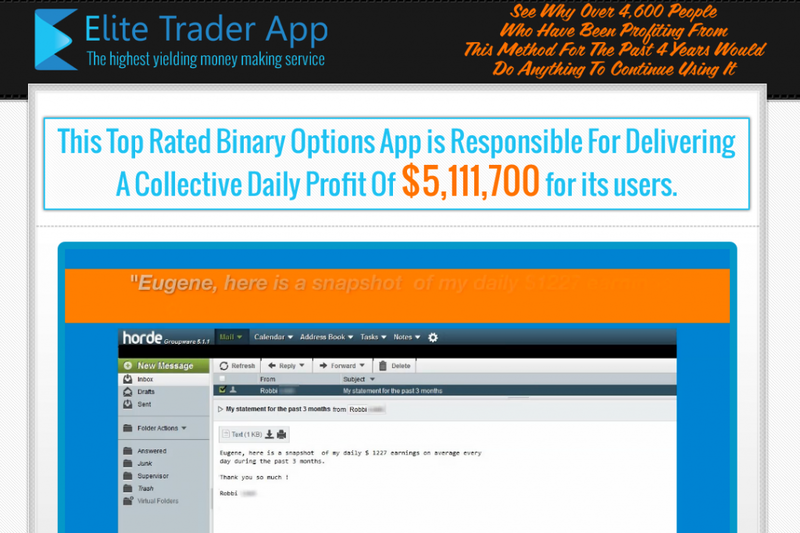 These binary options systems certainly love their bold claims and this one isn’t shy either as it mentions that it delivers a collective daily profit of $5,111,700 for it’s users. Sounds good – I wonder how many users there are? The system is supposedly developed by a guy named Eugene Conrad & the video starts off by reading out a whole load of emails this guy has supposed to have received from people who have been profiting from his system. The second one from Daniella (nice name) reads that she made $1,400 on Monday & $1,145 on Tuesday (sounds like a Craig David song). She goes on to say that she doesn’t even doubt she’s going to earn at least $1,000 the following day too – all very impressive claims, but are they true? The video itself is a bit boring & hard to watch but after the testimonials it goes on to show some screenshots of the system & claims that it’s creators have over 200 years of collective financial/trading experience that they’ve brought forward & put into this system. This system is completely free, which is one respect is a good thing but in another is a bad thing. Obviously it’s going because it means we don’t have to pay anything, but at the same time it’s not so good because these free systems have a lot of negativity surrounding them. This one claims in the video that its in their best interests for you to make money because they make money based on how much you earn. He quickly mentions that he’s going to elaborate on this but I carried on watching & didn’t find out what he meant by it. On the homepage it showed you a “live” overview of all the recent trades made by the Elite Trader App system out of 610 trades only 4 have lost. I’m glad it shows you that some trades have lost because some systems out there try and claim 100% success rates which is just not possible. At the end of the day binary options is a gamble and there’s absolutely no way you can guarantee a trade, any system that claims you can is simply lying. Mind, 4 lost out of 610 is still an awfully high success rate & almost sounds too good to be true especially when you come to think that professional hedge fund managers that manage invests into the billions don’t even obtain rates as high as this. There’s a ton of testimonials on the homepage of the website, over 50 in fact. As opposed to being video testimonials which is the case on most binary options sites they are actually screenshots of emails he’s received from satisfied users. Whether they are legitimate or not is another matter. I decided to dive in, join up & take a look inside the members area. After entering your name & email on the main page your then taken to a second page where you’re once gain asked for your name, email & this time also a phone number. More interestingly though is that on this page there are a number of video testimonials, but unlike the ones on other binary options websites these videos are actually of people logging into the system themselves & showing you their results. I have to admit it certainly looks pretty convincing. I decided to carry on & enter my details to get access into the system for myself & find out what it was all about however after entering my details I was simply taken to a broker named OneTwoTrade. There was no mention of the system but I’m assuming that I’d be provided with access to it after I’d made a deposit. I clicked to make a deposit and the pre-filled amount was $500 so I’m not sure how much you’ll need in order to get access to this system – with most systems it’s generally around $200 to $250 but as I say there were no instructions on this page to let you know what to do. Because of the lack of instructions I decided not to proceed, however I am extremely interested to hear from those of you who’ve actually gone on to deposit & used this system. How did it work out for you? Right now I can’t recommend it simply because I haven’t tried it out for myself, but I’m hoping to hear from some people who’ve used it & based on their experiences I’ll make a decision & might test it out personally to let you know what I think. I think as opposed to a “method” as such, with this system you’re getting access to recommended trades given by a group of people who apparently have over 200 years combined knowledge in the financial/trading industry. If that’s genuinely the case then this could certainly be a good system, but it’s whether or not that statement is true that’s my main concern. I’m looking forward to hearing your thoughts on this system, you can leave a comment below. Millionaire’s Brain Academy Review – Just a Daft Scam or Does Winter’s Training Work? Is eCom Profit Sniper a Scam? Read My Honest Review Before You Join! 6 Responses to "Elite Trader App Review – Scam Or Legit?" Any updates? I am attracted to this also but am hesitant as it just seems too good to be true, especially with all the binary deals running around, all of which are money sucking losing propositions. We need real results from real people. I signed up Jan 14/2015 with the initial $250 to test out. I wasted $ worse elsewhere. But wanted to test this out. Yes it sounds too good to be true. After a day and a half in I have won 2 trades and lost 1 trade. So I am approx. $16.25 in the money so to speak. But after signing up with a brokerage thru them be prepared to be contacted by brokerage to invest more to make more. They will clearly state they are not affiliated at all with elite trader app. An will clearly tell you the returns being stated are not true. The broker or asst broker on the phone makes it very clear that you cannot see these type of returns or he would not be on the other end of the phone taking sales calls. So if it looks like a duck, walks like a duck and quacks like a duck…. Well you know the rest. I will update if things turn out but I have a huge way to go if I am to see any success that the site if offering. Good Luck to all!